Label whores. Yes, we know, but have you seen our beer bottle collection? We drink to complete our set. Yes, that is how we rationalize our drinking. Also, we love their artwork and our two previous encounters with their beers. Jolly Pumpkin Artisan Ales seem to have our card but not the A-card or V-card, of course. The holy, most sacred B-card. Two different Jolly Pumpkin Artisan Ales, both 1 Pt, 9.4 Oz bottles, Luciernaga & Ordo de Calabaza, sat in the cooler at World Wines & Liquor in Mentor, OH. Rather than waste one and blog another, we decided it was combo time. Fresh off of our seasonal blind tastings and our Blood of Christ Winery review, we seem to be on quite a roll. Today is our "Pumpkin" roll. The first beer poured in our glasses tonight was Lucienrnaga, a spiced, bottle fermented ale brewed in the "tradition of the Grand Cru." It has a sweet, almost wheat taste that is purely originated in the Belgian tradition. After the long wait of the large amount of head to settle, this beer immediately hits with a coriander kick similar to most wheat beers but still retains a Belgian overtone. The beverage slides down the throat to a sweet finish. Though the spices are known, it doesn't have the kick this 6.5% ABV should. It promises but doesn't quite deliver, not that the delivery isn't bad. The next brew to settle in our glasses was Ordo de Calabaza. It is oak barrel aged and refermented in the bottle. 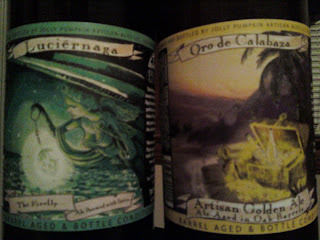 Unlike the seasonal Luciernaga, Ordo de Calabaza is a year round golden strong ale. In taste, it reminds us of both Victory's Golden Monkey (a Belgian style tripel) and Duval but the sweetness gives it a uniqueness unmatched by both. It has a cohesive start and finish with a slight kick letting you know that you are dealing with an 8% ABV brew. The smell gives false illusions of a floral scented wheat beer but when it hits the tongue, you have yourself heaven in a glass.